lower right: de Laszlo / 1926. III. Ailsa Mellon Bruce [1901-1969], New York; bequest 1970 to NGA. The painting is entered in the artist's sitters book (vol. II, p. 48, courtesy of Sandra de Laszlo, author of the Philip de László catalogue raisonné) as "Ailsa Mellon March 3rd" under the signature of her father, Andrew W. Mellon. 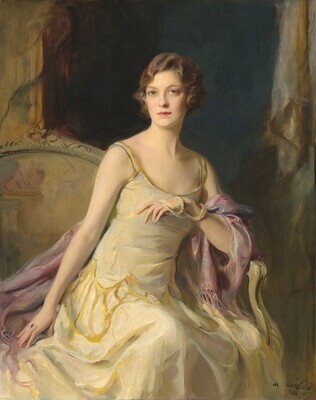 This indicates it was at least begun, if not also finished, prior to Ailsa Mellon's marriage to David Bruce on 29 May 1926. It is not known whether the first owner was the sitter's father, or the sitter herself. An Exhibition of Portraits by P.A. de Laszlo, M.V.O., for the Benefit of the Emergency Unemployment Relief Fund, Knoedler Galleries, New York, 1932, no. 1, as Mrs. David Bruce. European Paintings: An Illustrated Summary Catalogue. National Gallery of Art, Washington, 1975: 188, repro. Kopper, Philip. America's National Gallery of Art: A Gift to the Nation. New York, 1991: x, 257, color repros.